Finnish couple Markus Eerola and Minna Sakki-Eerola are today presented with the WWF Baltic Sea Farmer of the Year Award at a ceremony in Stralsund, Germany. They are awarded for their precise and innovative techniques that have created optimal soil structure and successful retention of nutrients at their organic crop farm Knehtilä. The Award was created six years ago by WWF to recognize the importance of farmers who are taking active steps to reduce nutrient runoff to the Baltic Sea. "Winning the Finnish competition was already an honor for us – winning the regional one is just unbelievable. It gives us strength to keep up our work; sharing good practices and collaborating with different actors. After all, cooperation and positive attitude are central to be able to achieve a more sustainable agriculture,” says Markus Eerola. Markus Eerola and Minna Sakki-Eerola have done a remarkable job on their 340 hectares of arable land since the 1990s. They have always been interested in Baltic friendly farming, including soil structure and tilling methods long before shifting to organic farming in 2010. They grow a diverse selection of crops, and manage grasslands and buffer zones that provide erosion control and ensure nutrient retention. “The most important environmental work is holistic, so we take environmental aspects into consideration in all our operations. Environmentally friendly agriculture is also a trump card for us when it comes to marketing our farm products," says Markus Eerola. Precision agriculture methods form the basis for all activities at the Knehtilä farm. This includes using advanced technology to analyze the soils and adapting use of equipment to fit different conditions. These efforts have resulted not only in optimal yields but also increased economic returns for their farm. "Long-term agri-environmental measures keep the countryside alive and diverse. We need more good practice examples like Knehtilä Farm to showcase how production can be developed sustainably. It provides added value for the farmer, the society and the environment, both on land and at sea,” says Ottilia Thoreson, Manager of WWF Baltic Ecoregion Programme. The award is presented at a ceremony at the International Baltic Sea Conference “A Greener Agriculture for a Bluer Baltic Sea” held at Ozeaneum in Stralsund, Germany. 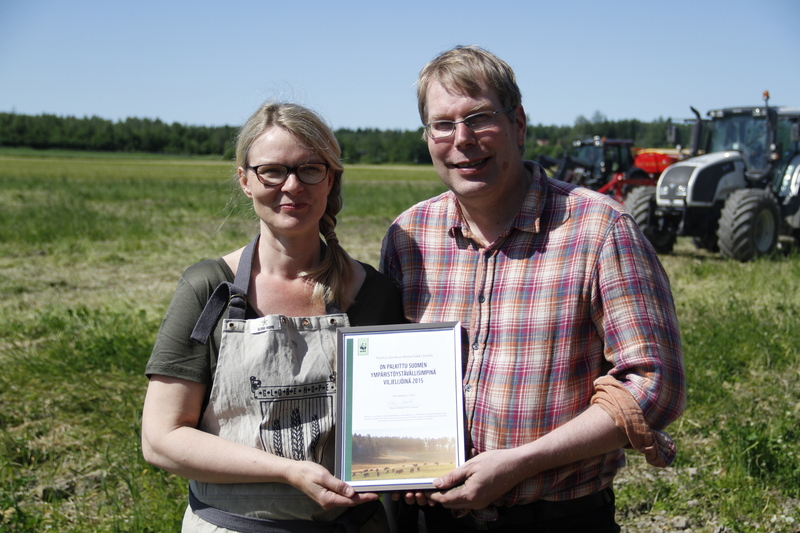 The international jury is proud to present Markus Eerola and Minna Sakki-Eerola with the Baltic Sea Farmer of the Year Award 2015 for their leadership in implementing precise and innovative techniques at their organic crop farm Knehtilä, which has resulted in optimal soil structure and successful retention of nutrients. By always taking the environment into consideration, they have also generated strong agricultural and economic returns for the farm, thereby providing a worthy model for other farmers to learn from. Furthermore, the jury was impressed with the couple’s passion for spreading information on sustainable agriculture, and their exceptional engagement in many national and international agri-environmental projects. Markus Eerola and Minna Sakki-Eerola are already exemplary ambassadors for environmentally conscious farming – and the jury is certain that they will continue to provide knowledge and inspiration for farmers across the Baltic Sea region. Regional winners of the WWF Baltic Sea Farmer of the Year Award 2015 - Finnish couple Markus Eerola and Minna Sakki-Eerola.